In 2006 I completed writing my Book " The Complete Boa Constrictor". This book took many years to complete & reflects my lifes experience & work with Boa constrictors. It covers Taxonomy - Genetics - Care - Breeding - Diseases & Disorders. 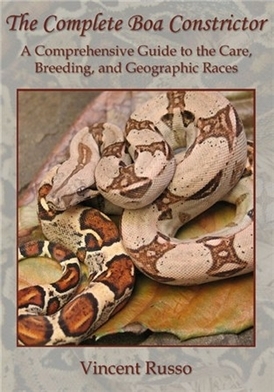 It also includes chapters for each Geographic Race & their locality types along with chapters on all 9 subspcies of Boa & their genetic anamolies - color & patten mutations. It is over 280 pages & over 450 color photos. Update 2018 - BOOKS ARE SOLD OUT.